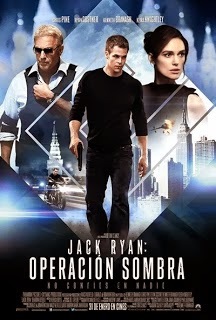 Reparto: Chris Pine (Jack Ryan), Kevin Costner (William Harper), Keira Knightley (Cathy Ryan), Kenneth Branagh (Viktor), Colm Feore (Rob Behringer), Karen David (Penn), Hannah Taylor Gordon (Sarah), Karen David (Penn), David Paymer, Seth Ayott (Teddy). Guión: Adam Cozad, David Koepp, Anthony Peckham y Steven Zaillian, basado en los personajes creados por Tom Clancy. Producción: David Ready, Lorenzo di Binaventura, Mace Neufeld y Mark Vahradia. Productoras: Di Bonaventura Pictures, Buckaroo Entertainment, Etalon Film, Mace Neufeld Productions, Paramount Pictures, Skydance Productions y Translux.